Very much at home, Guayaquil hosts umpires course. The largest city in Ecuador but not the capital; that privilege belonging to Quito; situated in the west of the country, Guayaquil was the recent home for a Basic Umpires Course. Funded by the Ecuador Table Tennis Federation and conducted under the auspices of ITTF High Performance and Development, proceedings took place on Tuesday 26th and Wednesday 27th June, the two days being preparation for an International Umpires Examination on Thursday 28th June. Overall a total of 13 students attended, 10 men and three women, travelling from throughout the country, the towns and cities of Quito, Tena, Portoviejo, Cuenca and Guayaquil being represented. The course conductor was Freddy Almendariz, the current ITTF Panam Competition Manager, a native of Guayaquil. 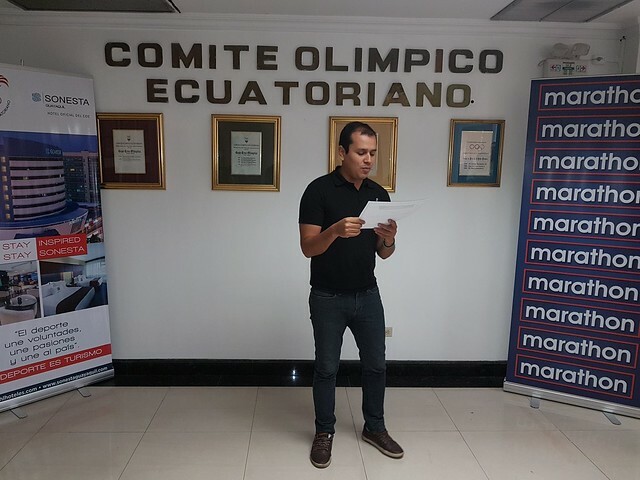 Locally matters were organised by Joe Elias Urdanigo, the Chair of the Ecuador Table Tennis Federation’s Umpires and Referee Committee. Step at a time but everyone had their eyes set on becoming an International Umpire; some like Roberto Torres from Napo, now in the twilight of his player career, wishes to continue his involvement in the sport by following the officiating route. Player to official; it is the same step that Vilma Durazno seeks to take; she had been waiting eagerly for the course to commence. Notably, the response from Vilma Durazno was echoed by German Quinoñez, born in Ecuador but spent 12 years in Colombia, before returning back to the country of his birth in 2000 to live in Guayaquil; he is an avid table tennis player. Everyone responded to the efforts of Freddy Almendariz, his enthusiasm in whatever role he assumes never diminishes; his attitude always positive. The efforts made were greatly appreciated by all, none more so than by José Banda, an experienced umpire who has officiated in many national competitions. Matters concluded with the presentation of certificates; Freddy Almendariz congratulated all concerned, a total of 11 course members reached the required standard. The participants were: Byron Alvarado, Paola Arias, Catalina Arteaga, Jesus Aviles, José Banda, Frank Carriel, Diana Durazno, Luis Intriago, Carlos Nieto, Fernando Sanchez, German Quinoñez, Roberto Torres, Edwin Villacis.